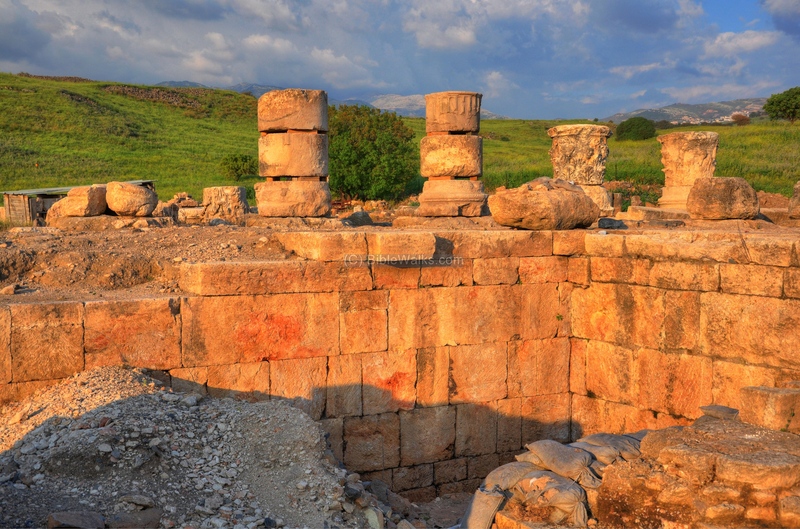 Khorvat (Horbat) Omrit is a newly discovered Roman imperial temple complex, south-west of Banias (Caesarea-Philippi). It was located on the route of a major Hellenistic/Roman road leading to Banias and branching to major destinations. The excavations at Kh. 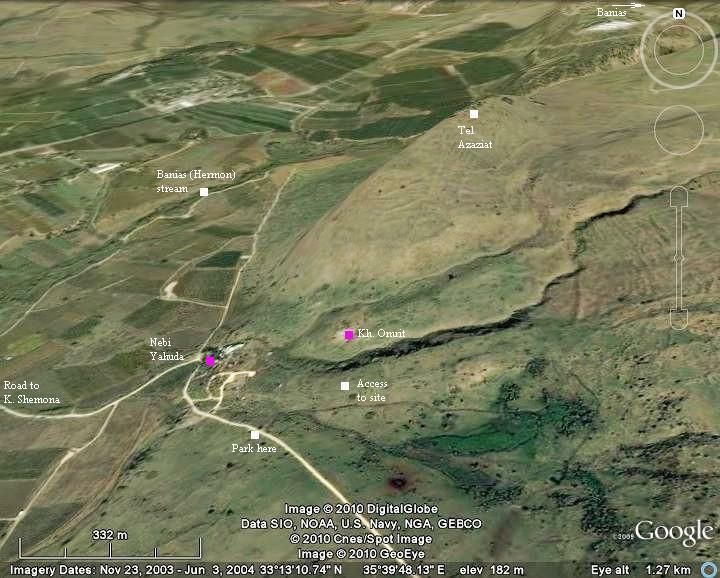 Omrit are conducted on the raised area above the Druze Holy tomb of Nebi-Yehuda, at a height of 120m above sea level. It is close to Kefar Szold (3KM). 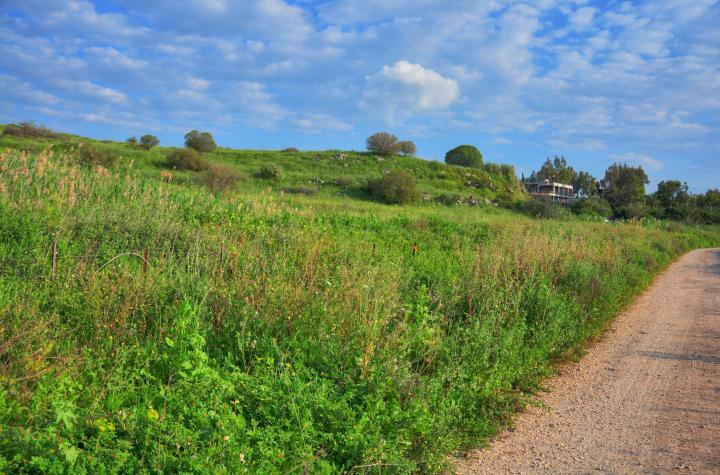 There is a paved road from the main road on the south side of Kiryat Shemona that allows vehicles to reach the area of the tomb. You can park on its south side (indicated by "park here" below), the walk up to the archaeological site ("Access to site"). Pointing on purple points will automatically scroll to the relevant section in this page. 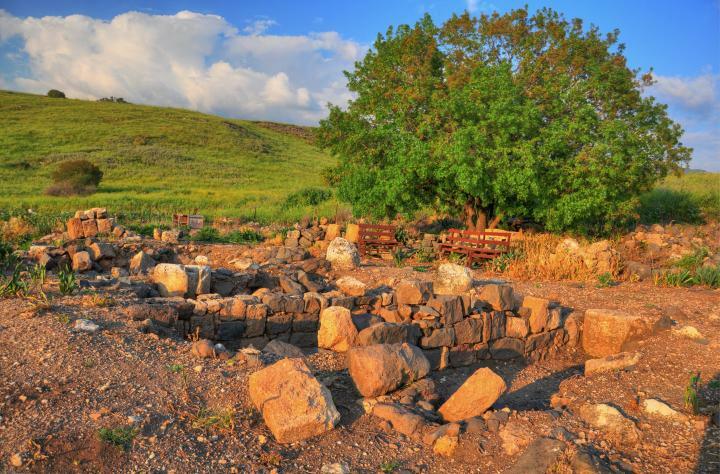 Omrit is located on the south side of a major ancient route, a road going south from Banias (Caesarea-Philippi) to the Sea of Galilee and the Central part of Israel and beyond. At Banias, located nearby, this road split to three routes - northwards (Emesa and Syria), eastwards (Damascus and beyond) and westwards (Tyre/Sidon and the coastline branch of Via Maris). These roads are marked on the map. The site was part of the land of Iturea, and perhaps marked the entrance to this land and to the city of Caesarea-Philippi. During the 3rd and 2nd century BC the area was under the control of the Greek-Seleucids from the north, who established the Greek city of Panium (Paneas) several KM north of Omrit. 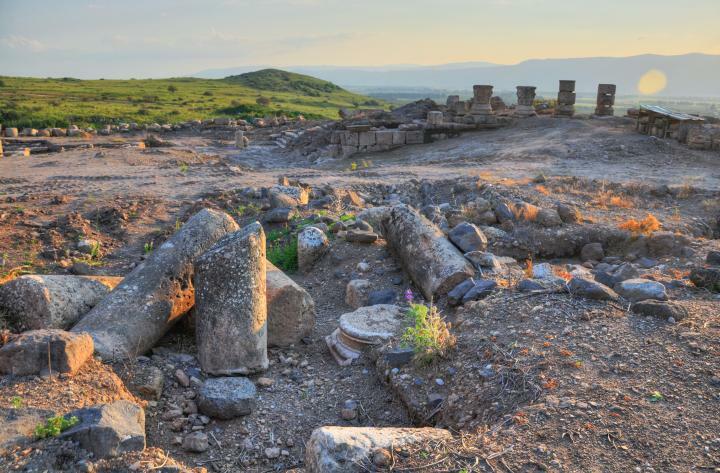 The ruins of a 2nd C BC shrine was found here under the podium of the Roman temples. In the excavations the archaeologists found architectural elements including carved limestone pieces of gold leaf and painted plaster, which enabled them to determine the date of its construction. The Romans annexed the land in 63 BC. 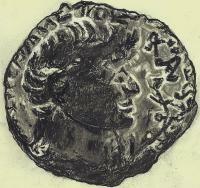 General Pompey implemented political reformations, which removed the Golan from the Hasmonean state. He reassigned the north-eastern parts to the Itureans, an Arab tribe who received parts of the Galilee and the Golan. The Itureans are referred in Luke 3,1: "Now in the fifteenth year of the reign of Tiberius Caesar, Pontius Pilate being governor of Judaea, and Herod being tetrarch of Galilee, and his brother Philip tetrarch of Ituraea". Kh. Omrit may have been the entrance to the land of Ituraea, and for this reason a temple was built here. Herod the Great, a Jewish Roman client King of Israel (39 BC-4 BC), subdued the Itureans (23 BC) following their inaction against outlaws. 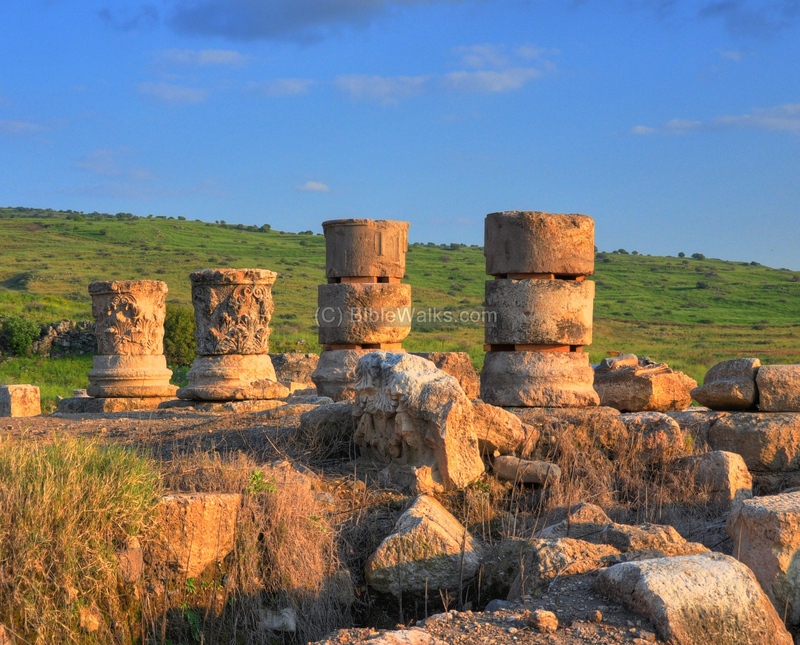 As a result, Augustus Caesar gave the northern Golan, including Paneas, to Herod the Great (20BC). Josephus writes about this and added that Herod constructed a temple in honor of his beneficiary (Wars 1 21 3) : "And when Caesar had further bestowed upon him another additional country, he built there also a temple of white marble, hard by the fountains of Jordan: the place is called Panium...". 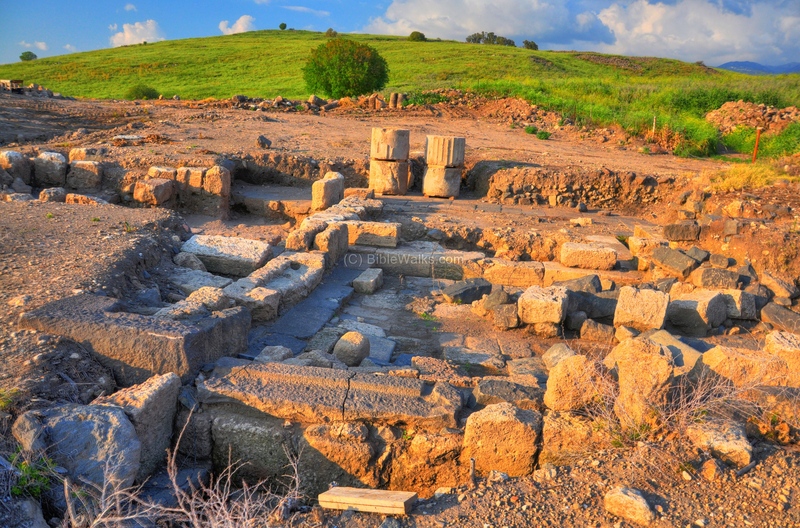 The excavations unearthed a Roman temple, and identified two phases of construction which were built around the Hellenistic shrine (see below). They also identified a colonnaded south-north section of a Roman street. It crossed the valley on top of a bridge, connecting the temple to the Roman road north of the temple. Also found was an aqueduct system that supplied water from the east and northeast. The Roman temple was destroyed in the massive earthquake of 363 AD, which devastated most of the Galilee and Golan (such as Sepphoris, Beit Shean, Chorazin, Hamat Tiberias). A public building, perhaps a small chapel, was later constructed in the area of the temples, reusing their stones. During the Byzantine period a light industry was located in structures on the north-east side of the chapel, perhaps to support the monks. The building collapsed in a severe earthquake during the 8th Century (749AD? ), and the site was abandoned. During the 13th century a number of crude houses were constructed in the site for a brief time. Several Mameluke graves were dug here by the archaeologists. Kh. 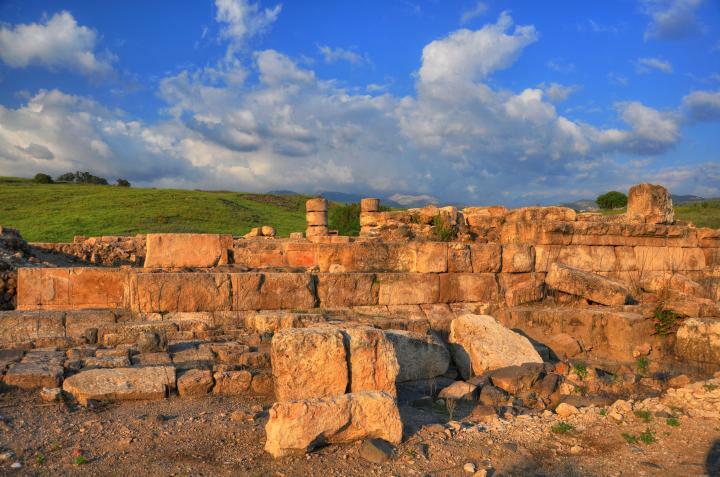 Omrit is situated on the foothills of Tell Azaz (Azaziyat), a Syrian fortress that was conquered by Israeli forces after bloody battles during the six-day-war (1967). The area near Omrit is still heavily mined, as indicated by red triangles along the fences. A preliminary survey was conducted here in 1974. 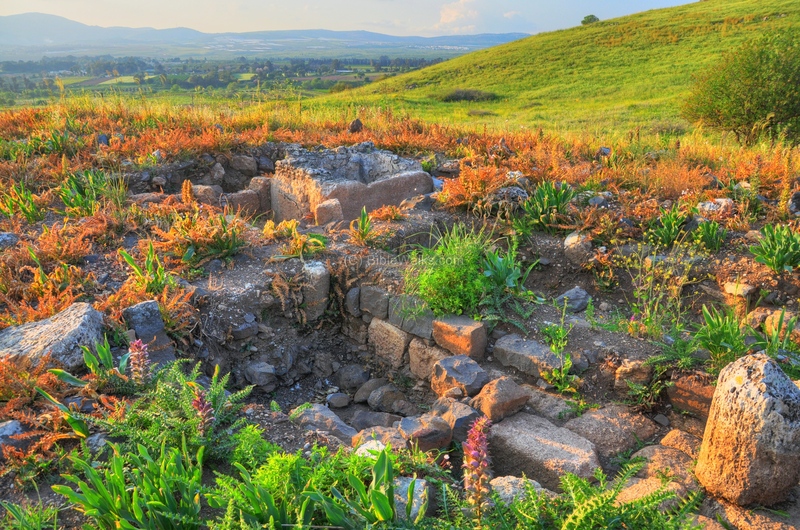 The site is excavated since 1999 by an expedition from the Macalester College of St. Paul, Minnesota, and headed by Professor O. Overman and co-directed by Gabi Mazor of the IAA. Since Omrit is a remote site, most of its stones were not robbed after its demise. 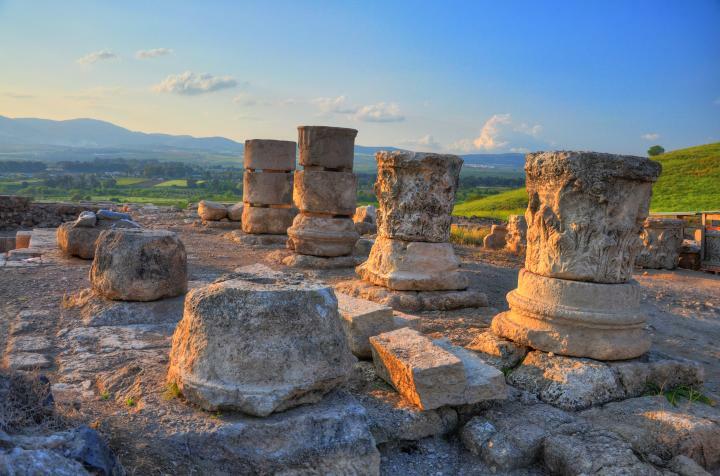 Therefore, the site can be fully reconstructed and transformed into a wonderful National Park, with a complete Roman temple standing in situ. The plan of the excavation area is illustrated on the right, as revealed by the archaeologists. The Roman road to Caesarea-Philippi passed on the foothills of Tell-Azaz (Oz), across the northern valley. The temple area in Omrit is the focus of the digs, with an entrance facing the east. An altar is located east of the temple. A Colonnaded Roman street connected this side of the temple to the main Roman road. 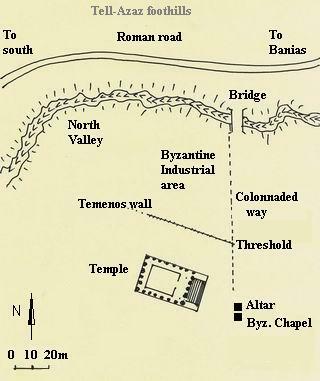 The Colonnaded way passes a monumental threshold in the wall of the sacred area (Temenos), crosses a bridge over the north valley, and joins the Roman road past the north valley. 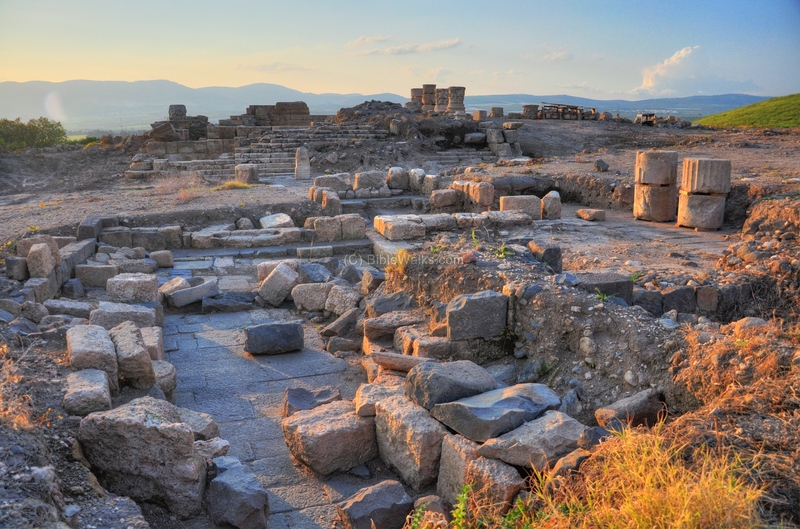 At a later period (Byzantine), an industrial area was constructed north of the temple area. In this area are shops, installations, and a winepress. 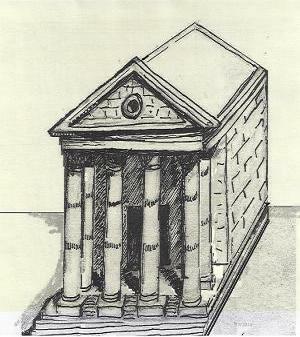 In the excavations of Omrit a grand Roman temple was reconstructed, as illustrated below. It was actually built in three phases - an earlier smaller Hellenistic shrine built in the 2nd century BC, a second phase built above the shrine in the 1st century BC (area marked in yellow) , then the third phase which expanded the temple in the beginning of the 2nd century AD (area marked in blue). Each phase encompassed the previous phase. 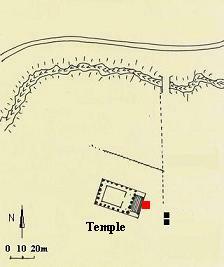 The second phase (marked by the yellow area above), with four columns on the front of the temple and an area of 14 x 23M, 4m high podium, and about 18m high from surface level to the top of the roof. It appears to be a Corinthian order design. The illustration on the right reconstructs the temple. The third phase, constructed no later than 115AD , perhaps under the reign of Trajan, increased the size of the podium area on three sides. This expansion is marked in the above plan in blue. A fill of 1.5m separates the area of the podium between both temple phases. The podium was increased to 18m x 25 . Two more columns were added on the front of the temple, a new row of columns were added on three sides, and the eastern staircase became wider. 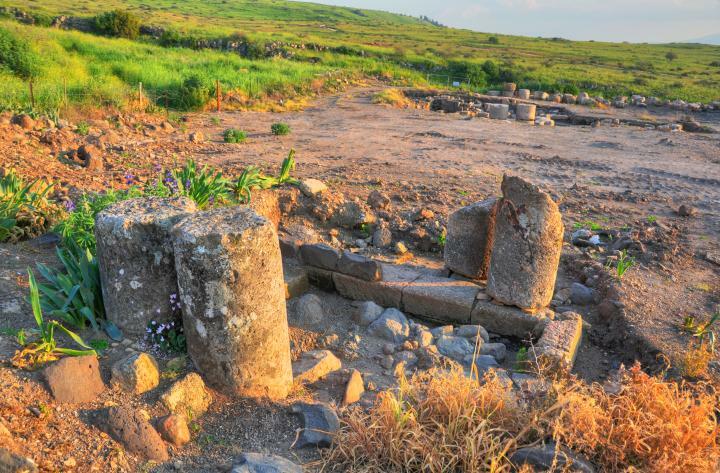 Identification of the temple - The ruins of another temple were found, according to the excavators of the nearby Banias (Caesarea-Philippi) , on the western side of the cave of Pan. 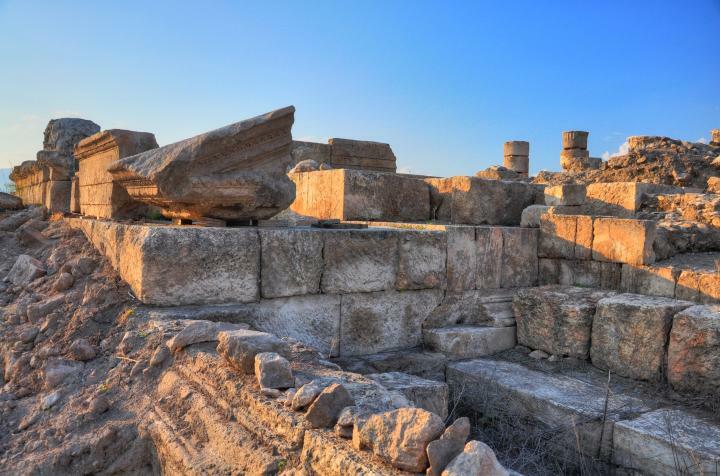 It was speculated that that temple in Banias was the temple referred by Josephus - built of white marble. 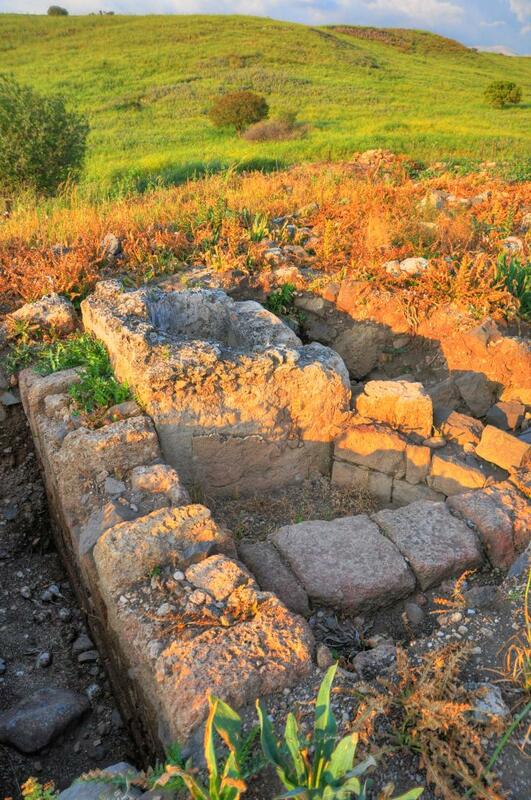 However, the newly discovered temple in Omrit may have been this temple, which was dedicated to Augustus ( aka "Augusteum") . 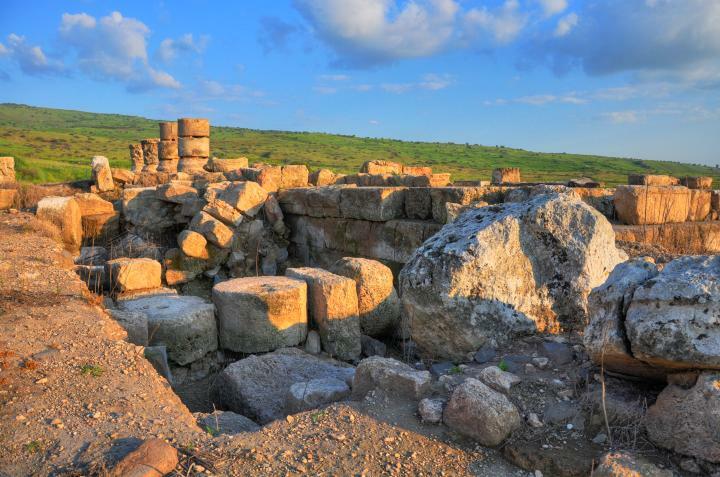 These conflicting theories are still a mystery, only to be resolved in the following excavation seasons. 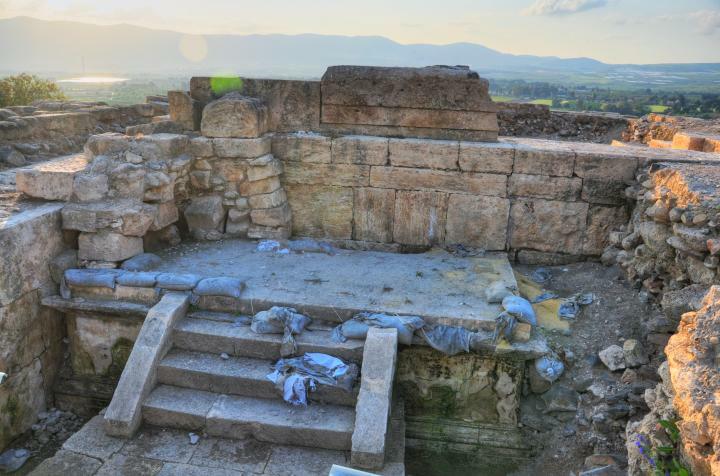 The Roman temple (second phase) may have been constructed by Herod, honoring his beneficiary - Augustus Caesar - as reported by Josephus. 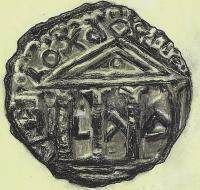 A similar design is seen on his son's coin (on the right) which may have illustrated this temple. 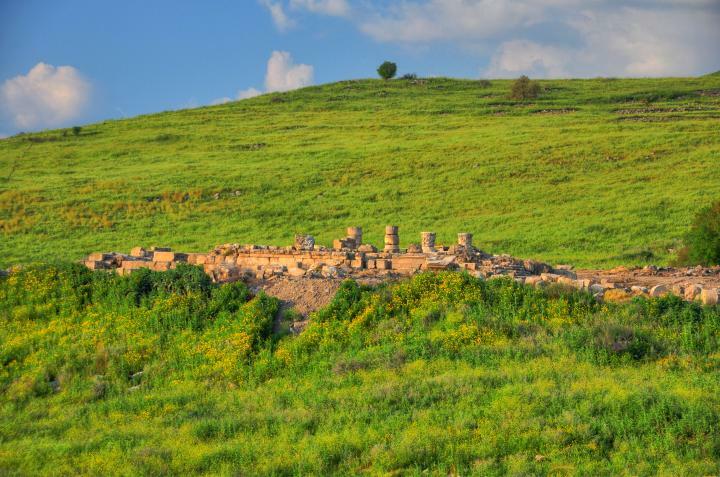 Omrit is situated on the southern footsteps of Tell-Azaz (Azazyat, Oz), which is seen as a green hill in the center of the photo. 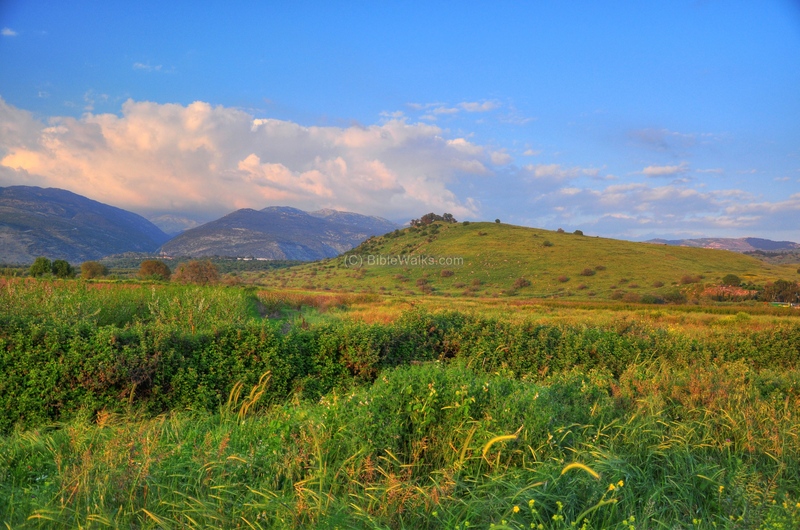 It is located south-west of Banias, on the slopes of Mt Hermon which stands in the far background. 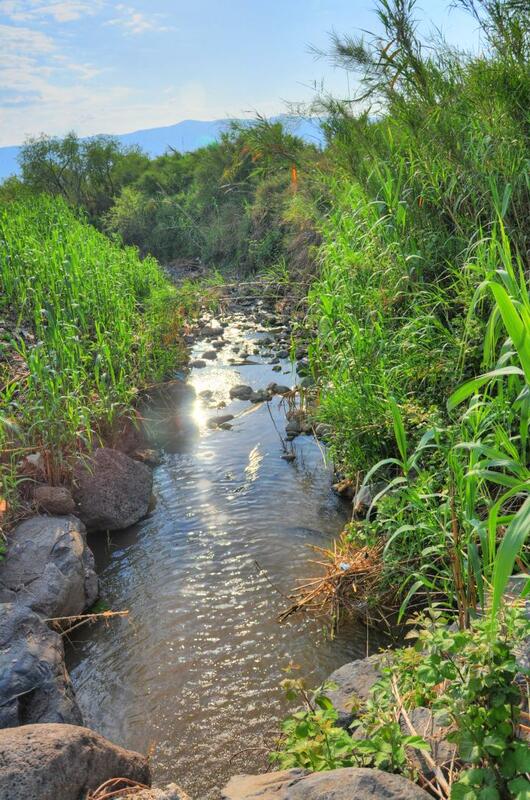 A brook passes on the south side of Omrit, which receives its waters from the springs of the nearby Nebi Yahud, a Druze holy site. Its waters join the Hermon (Banias) stream, one of the sources of the upper Jordan river. 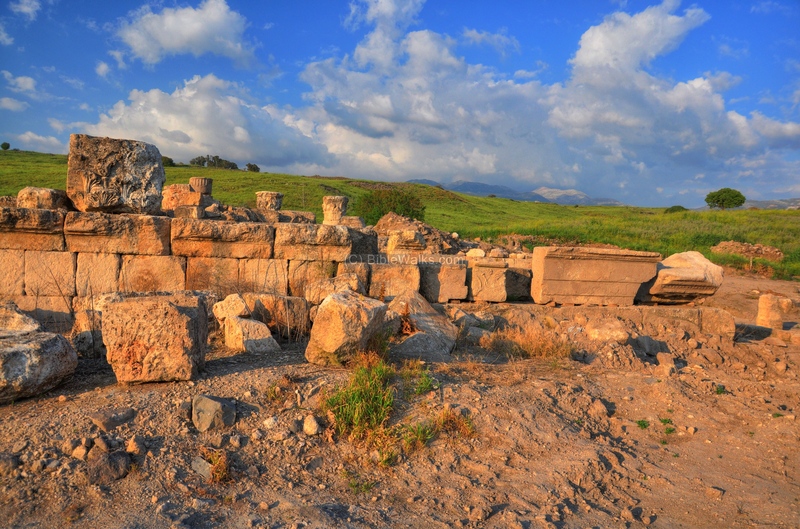 The ancient site of Omrit is approached from a dirt road from the south. The temple complex can be seen in the center of the Tell Azaz hill. A closer view of the site is seen below. 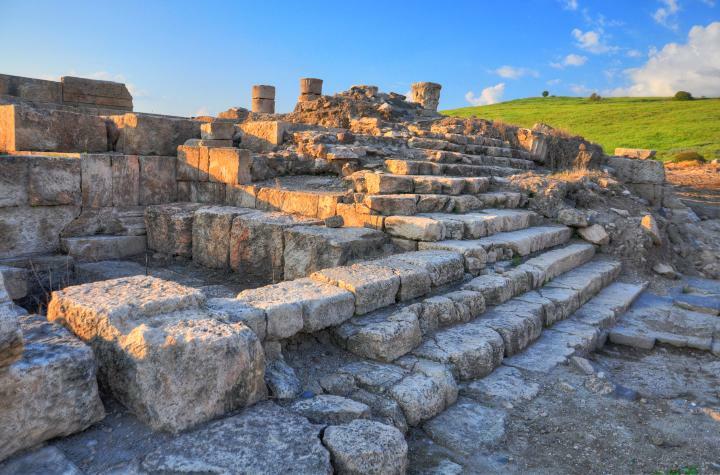 During the Roman period the temple structure reached 20M higher, welcoming the visitors to Caesarea-Philippi that came from the road that passed on the other side of the temple. 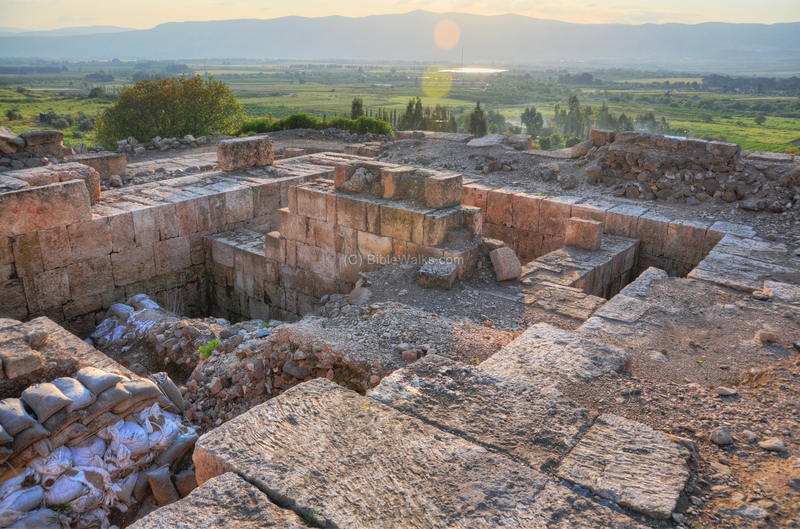 In the center of the excavated area stands the impressive temple, which is yet in the process of reconstruction. Its location is marked as a red square on the plan. The photo below shows the eastern side of the temple, with the wide staircase of 13 steps leading up to the podium. This grand staircase was the only entrance to the temple, matching the same design of the Augusteum temple in Samaria-Sebaste. The staircase was part of the third phase of the Roman temple, built before the year 115AD. The following photo shows a section of the corner stone of the roof which lies on the podium. The limestone piece has a carved decorative molding along the horizontal geison (cornice) and the raking (inclined) geison. 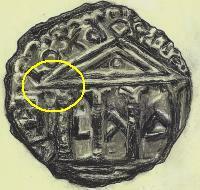 This section is marked on Herod Philipp's coin of the tetra-style temple, which may have illustrated the "Augusteum" temple in Omrit. On the north long side of the temple, parts of four of the Corinthian columns were reconstructed on the podium. In the foreground are other elements of the structure. Another view of the standing columns - looking from the podium towards the north-west. 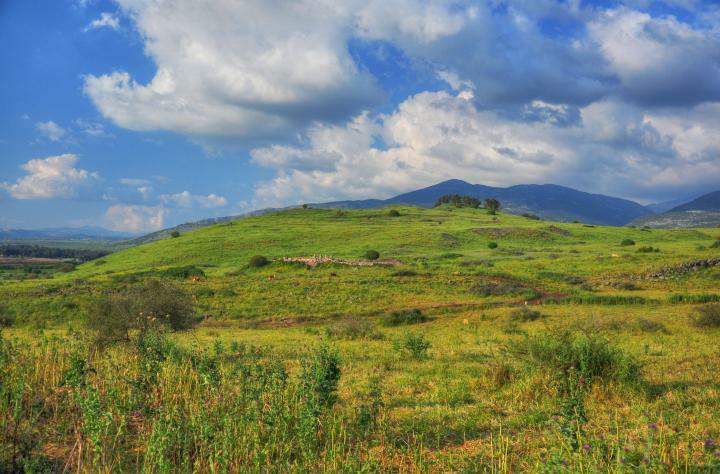 The hills in the background are on the border of Lebanon, overlooking the city of Kiryat-Shemona. 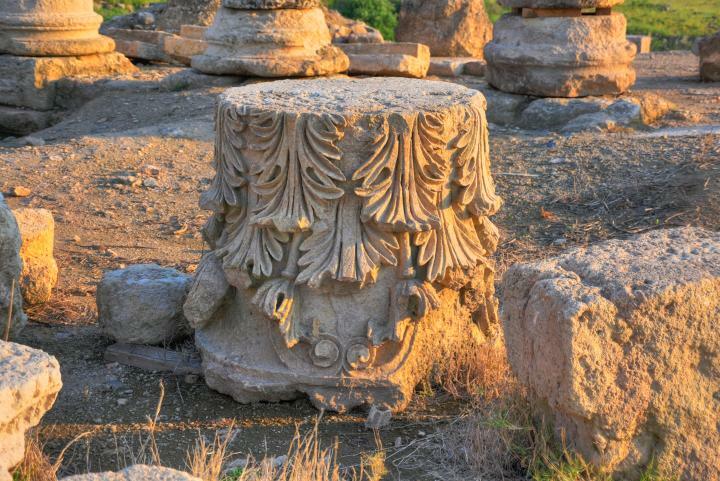 The capitals, cornices and bases are carved limestone. A decorated Corinthian pilaster is seen in the following photo. The north-west corner of the temple is shown in the photo. 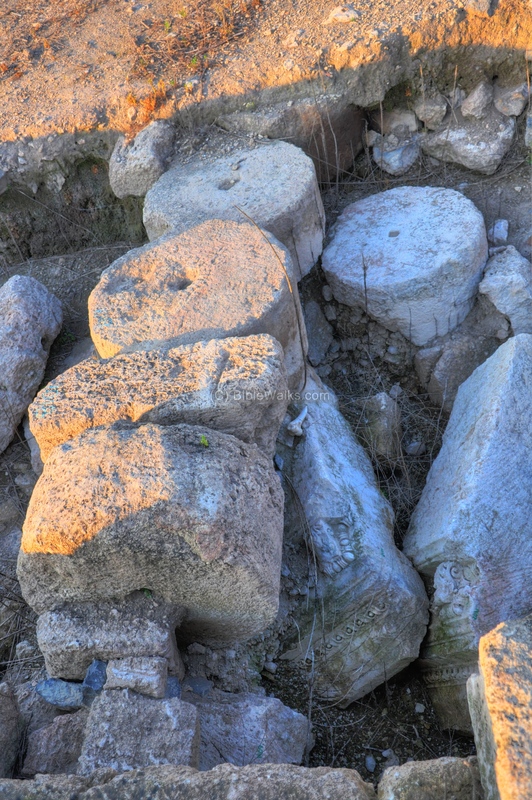 Segments of the columns lie in the exposed rubble. A panoramic view of the south side of the temple is seen below. A view of the rear side of the temple is seen below. In the left background are the plains where Lake Huleh (Hula) once was located, but now the lake has been mostly dried out to clear the land, and has receded to the south. The following photo shows the rear (western) wall of the temple. The area on the right side was the extension of the podium added during the third phase. The space between the walls was filled above the basalt bedrock with blocks, stones and discarded elements from the earlier shrine, so the excavation team carefully sifted through the debris in order to examine the interesting parts. A view of the center of the temple is shown in the following picture. 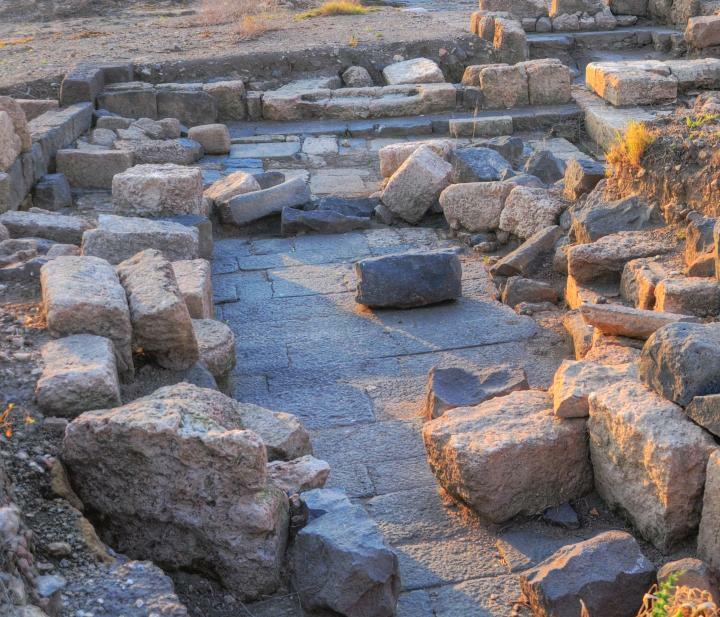 The fill under the floor of the podium was extracted during the excavations in order to examine the elements used by the builders of the temple. An underground crypt is located under the floor. Its walls are treated with colored plaster. 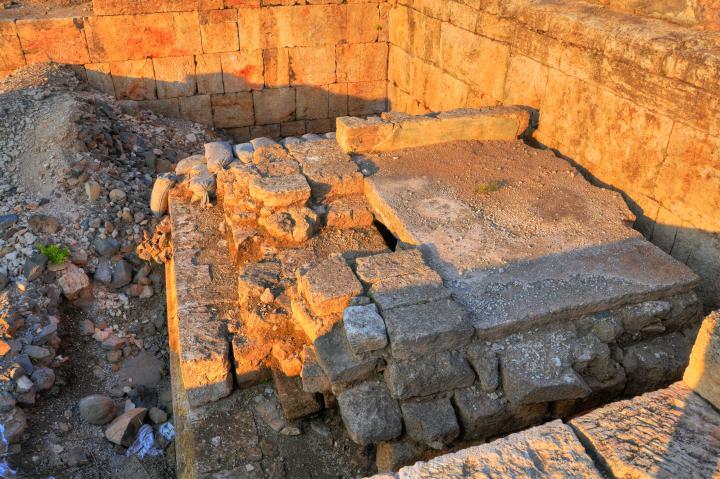 An earlier Roman temple was found buried inside the second temple. 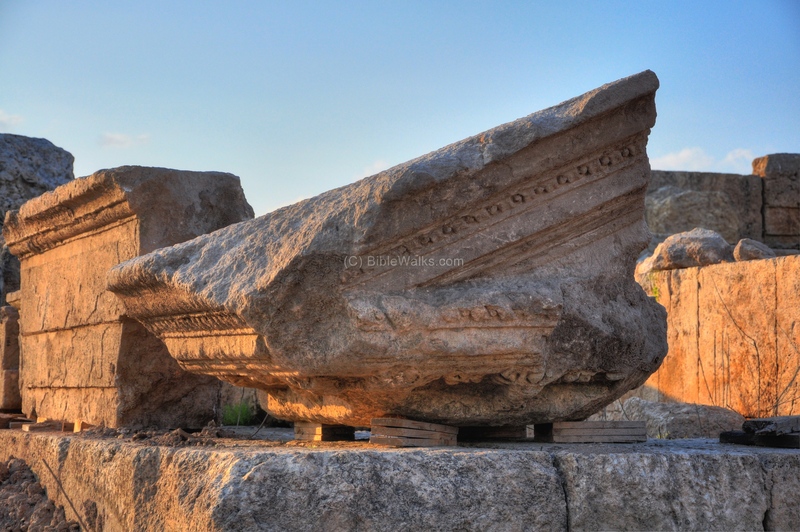 It was constructed during the earliest phase of occupation at the site, at the 2nd century BC, during the Hellenistic period. 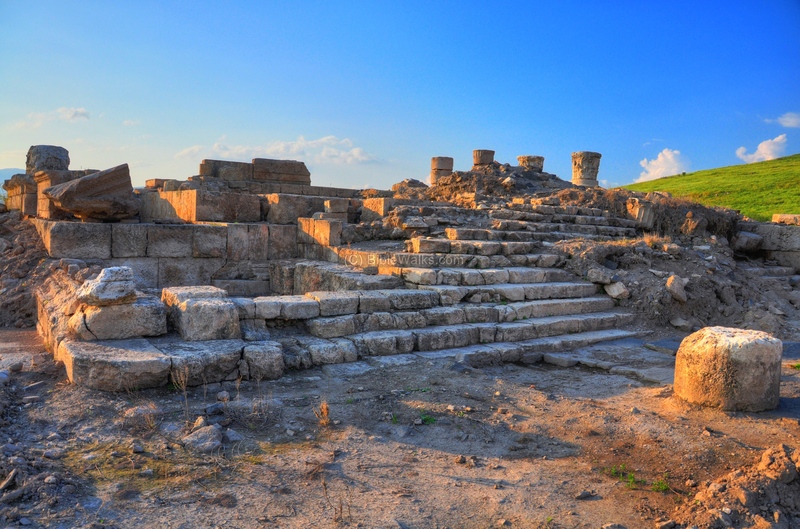 Its podium and eastern staircase, with three steps, is seen in the photo below. 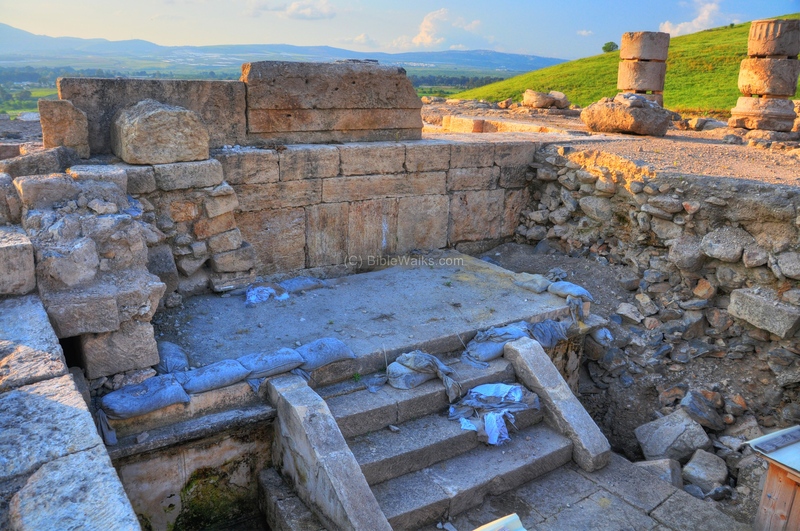 This small shrine has a lower and upper molding (seen below the steps) and two underground chambers (under the pdoium), just like the later temples. A thin layer of white plaster covered the vertical surface, and molded into raised relief panels over the horizontal grooves. The west side of the floor of the earlier temple is seen on the other side of the wall. It has an opening to the underground chamber, which is visible in the center of the podium. We peeked inside but there was nothing interesting to see. About 15m to the south-east of the temple is an excavation area, where the temple's altar was located during the Roman period, and a chapel during the Byzantine period. their location is marked as a red square on the plan. The following picture is a view from the east side, with the temple in the background. A view from the south (looking towards Tell Azaz/Oz/Azaziyat). 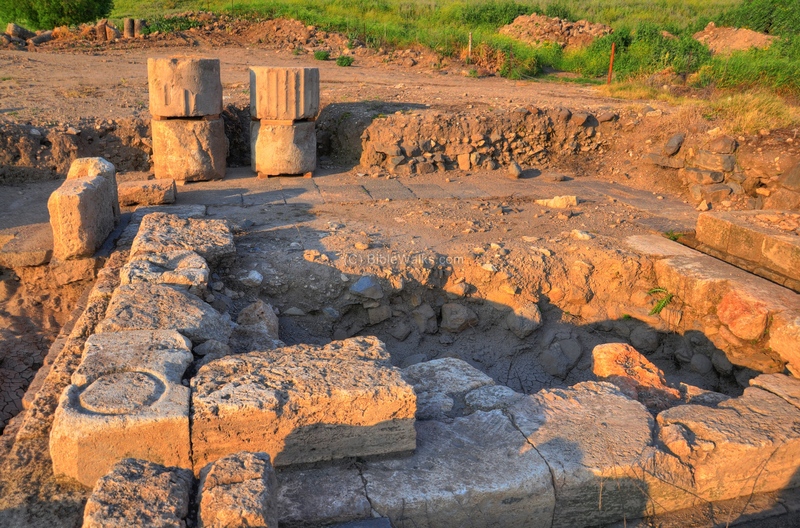 On the upper-right side of the excavated area is a Roman-period altar, while on the left (west side) are foundations of a small structure which was a statue base or an ancillary altar. On the lower center are remains of a later structure - a Byzantine chapel. A closer view on the altar. The altar’s west wall was exposed to its preserved height of three courses, seen on the left side. Photo below: View towards the south side, with Givat-Ha'em ("Mother's hill) in the background. The base of the structure is a small Byzantine chapel (c. 6.56 × 8.22 m) with an exterior apse at its east (left) end, which was built next to the earlier altar. The Byzantine chapel reused the Roman-period basalt pavement as its floor, and its walls were based on limestone blocks from the Roman period structures. A threshold of a doorway is visible on the upper (west) side. This door was a double-leaf type and opened inwards. On the north east side are a number of traces of houses and installations, which were part of the Byzantine period industrial area. the area is marked as a red square on the plan. The excavations revealed shops, installations, and a winepress. It may have supported the residents of the village and the chapel that replaced the pagan temple during that period. On the north east side of the temple are traces of ruins from the colonnaded Roman street. The north-south street connected Omrit to the Roman road across the valley (wadi). Its location is marked as a red line on the plan. The picture below shows ruins of a section of the Colonnaded street. In the center of the background is the temple. Another section of the street is viewed in the next picture. The street passed a threshold through the wall of the sacred temple (called the Temenos wall), arriving to the eastern entrance to the temple. 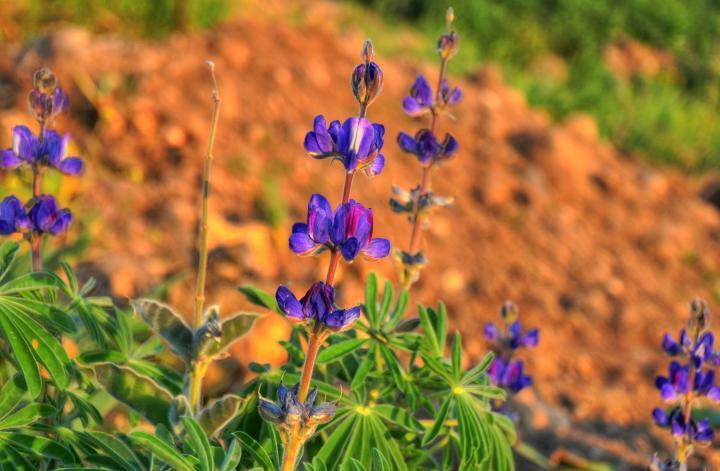 Among the ruins and around the site are flowers called Blue Lupine (Latin: Lupinus pilosus, Hebrew: Turmus He-Harim). 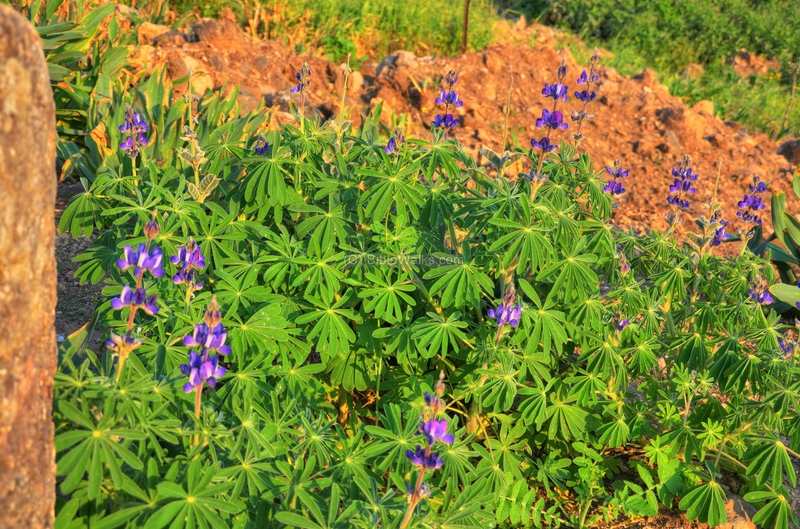 These annuals flower during the late winter and spring time. 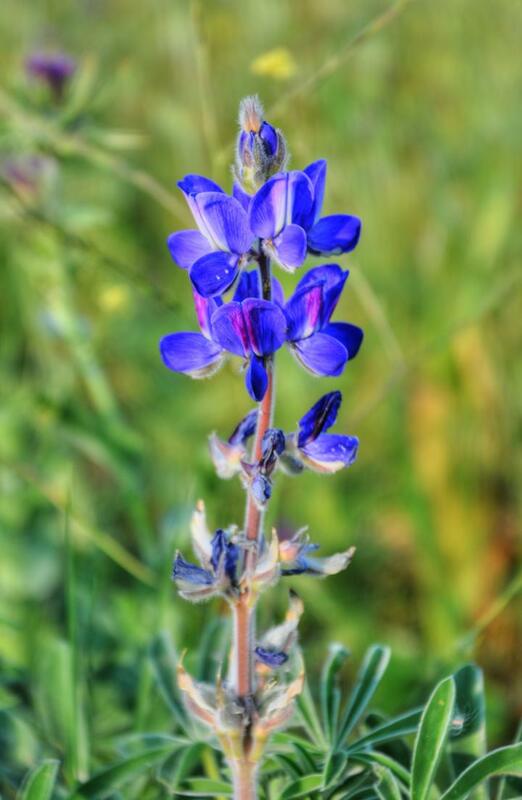 Its seeds are toxic and can used for medical treatment. During ancient times the farmers boiled the seeds, extracting the poison, and prepared Turmus snacks. 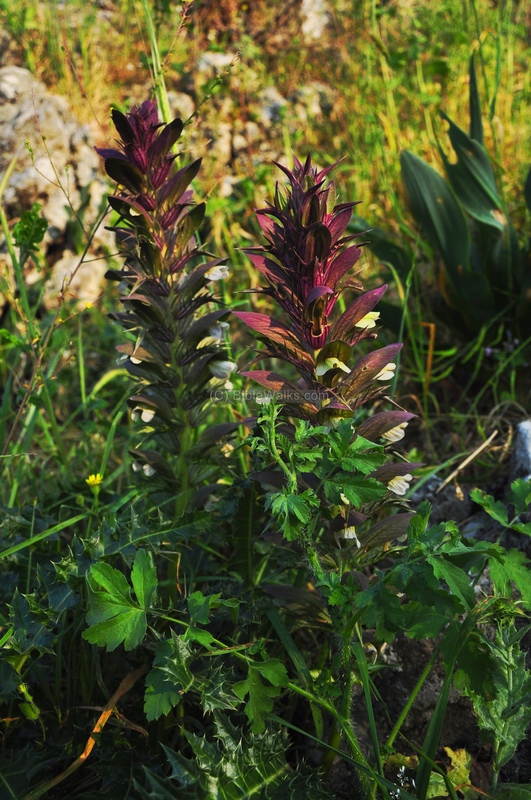 Another non-woody perennial is the Syrian Bear's-breech (Latin: Acanthus Syriacus, Hebrew: Koziz Suri), which flowers here in the spring. 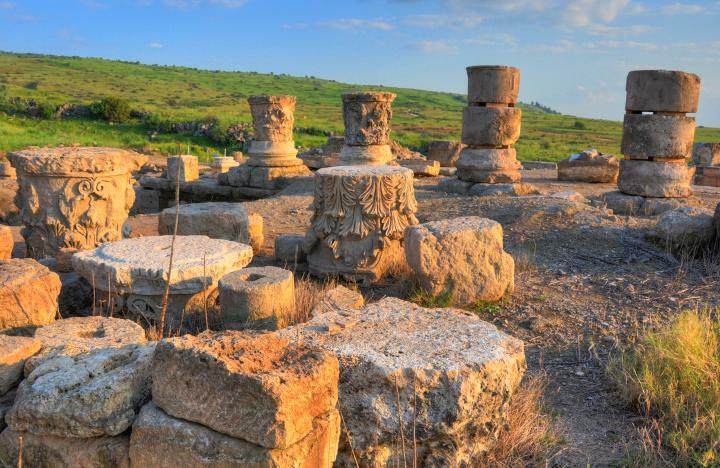 Omrit is located near the Druze Holy site called Nebi-Yahud (Nebi-Huda). 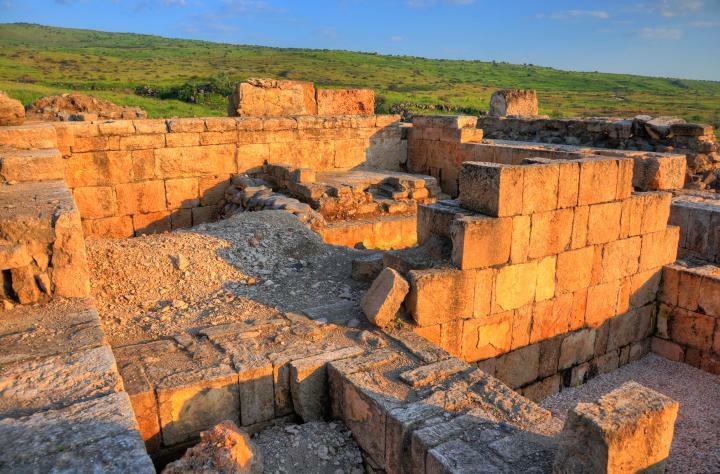 According to their tradition, Yehuda (Judah) - son of Jacob - is buried here. 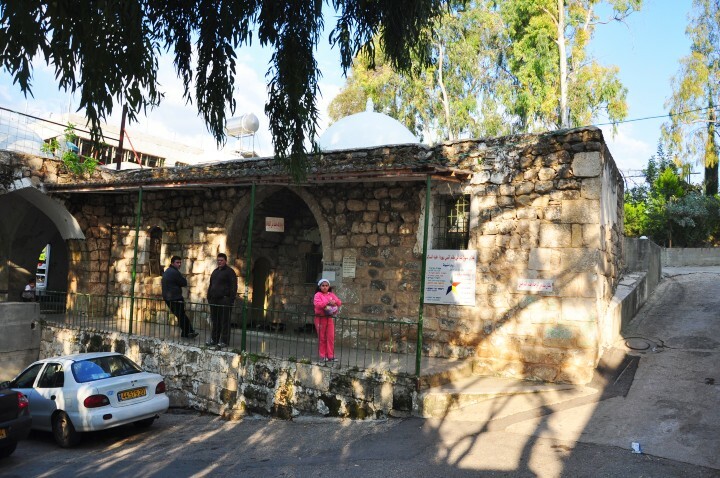 Although the Bible hints that all the sons of Jacob were buried in Egypt, the Druze locate his tomb to this site, and another tradition holds that he was buried near Yahud (east of TelAviv). Around the tomb are a number of structures and meeting place. 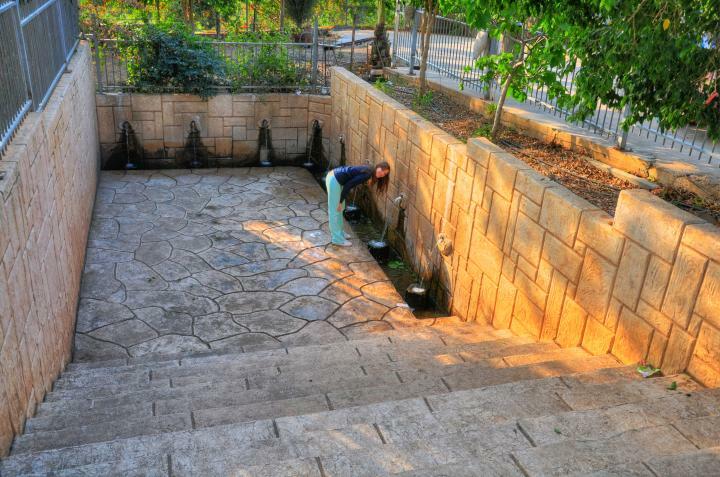 A spring is located on the north side of the Holy site, and provides running water to the visitors. The white dome and structure of the tomb of Judah son-of-Jacob is viewed below. The tribe of Judah resided far from here - in the center of Israel. So why is the tomb named after Judah? 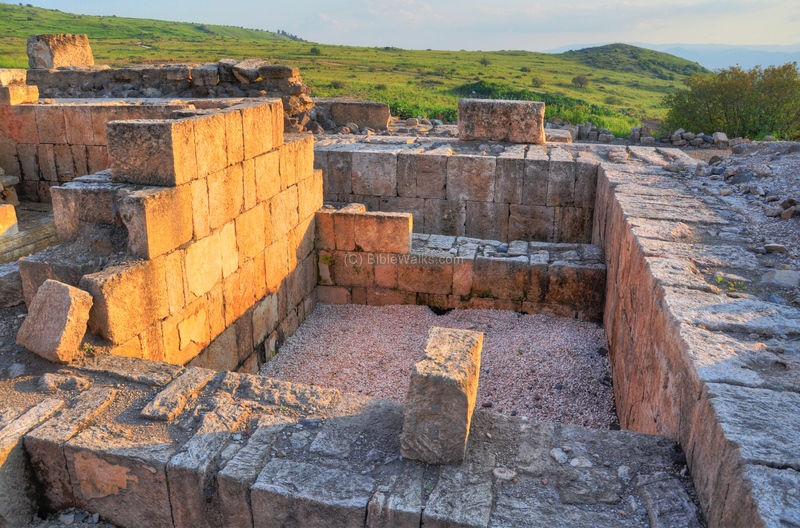 The source of the tradition of the tomb of Judah may have been based on the verse in Joshua describing the borders of the Naphtali tribe (19,32-4): "The sixth lot came out to the children of Naphtali...And then the coast...to Judah upon Jordan toward the sunrising". The reason why the tribe of Judah resided here is debated among scholars. This may have been based on a number of families belonging to the tribe of Judah who resided in this area. 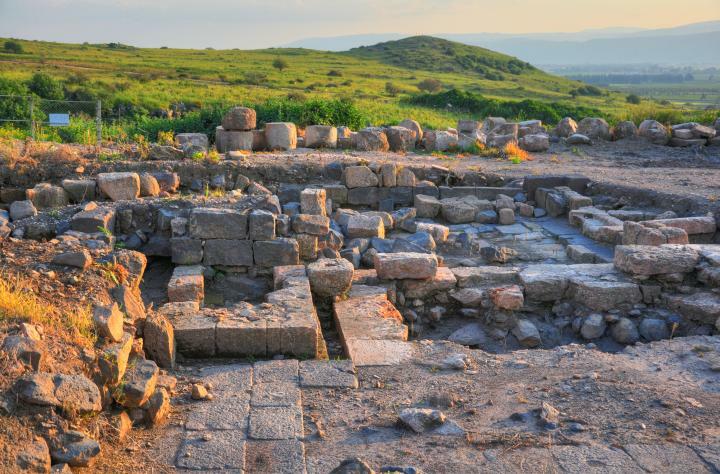 According to 1 Chronicles 2 21, there is a report that the families of Jair (grandson of grandson of Judah, who remarried with a Gilead princess) lived nearby: "...had three and twenty cities in the land of Gilead". The Roman road, north of the site, connected the Sea of Galilee and Scythopolis (Beit-Shean) to Caesarea-Philippi (Banias). 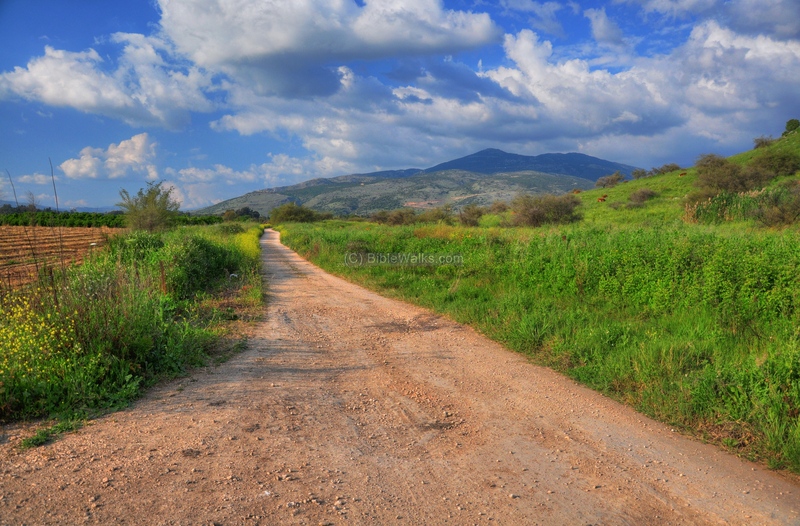 This section was referenced in the New Testament as one of the important events in Jesus life (Mark 8 27): "Now Jesus and His disciples went out to the towns of Caesarea Philippi; and on the road He asked His disciples, saying to them, "Who do men say that I am? ", and Peter confessed Jesus as the Messiah. Azaz - Biblical name (1 Chr 5 8): "And Bela the son of Azaz, the son of Shema, the son of Joel, who dwelt in Aroer, even unto Nebo and Baalmeon". Means a strong person, based on the Hebrew name "Az" - fierce, strong. Tell Azaziyat - the Arabic name of the hill; used by the Syrians as a fearful bunker overlooking the Israeli settlements in the valley, conquered by Israel in 1967.